Hosted by and featurng Gilberto Gil the Back2Black Festival has been produced by the Barbican in association with Zoocom Events and Serious who are widely known for their stellar lineups during the London Jazz Festival. This first London Back2Black festival features a strong emphasis on UK African connections and communities including Afro-Caribbean artists and brings together a heady mix of different traditions and musical genres, including Samba, Jazz, Funk, R’n’B, Blues, Rock, Reggae, Dub and Hip Hop – all of which have been heavily informed by Africa. 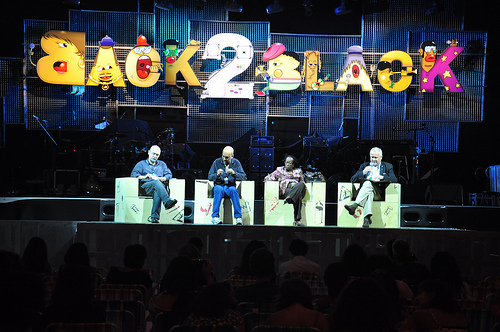 Since its inaugural edition, the Back2Black festival has taken place in the beautiful setting of the disused Leopoldina railway station close to downtown Rio de Janeiro. To recreate a similar setting, the London festival will be held at Old Billingsgate in the heart of East London, with four different stages and an extensive offering of concerts, debates and exhibitions. The eclectic line-up will feature more than 30 Brazilian, UK and international artists, groups, thinkers and leaders, including host Gilberto Gil. A large-scale exhibition by Brazilian artist and director Bia Lessa forms the backdrop of the festival.